They may be one of the NBA's most famous 'bro-mances', but there's no love lost when Kiwi basketball Steven Adams faces former Oklahoma City teammate Enes Kanter out on the court. Through two seasons together on the Thunder roster, the centre pairing became known as 'The Stache Brothers' for their trademark facial grooming. 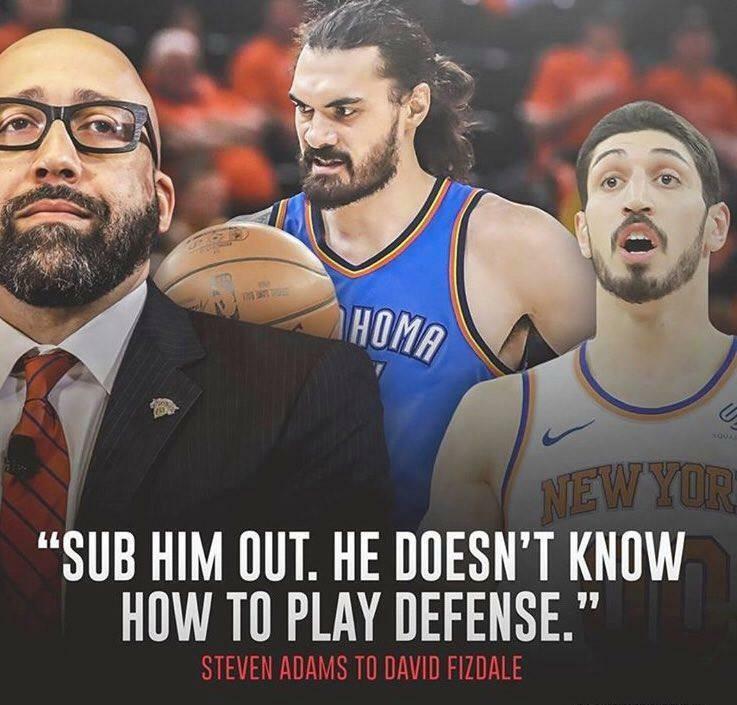 But since Kanter was traded to New York, their reunions have taken on a bittersweet twist, with Adams advising Knicks coach David Fizdale to take his mate out of the game in yesterday's 128-103 Thunder victory. "Sub him out," Adams yelled. "He doesn't know how to play defence - we're running pick and roll every time." The Rotorua giant also mercilessly 'posterised' his mate with a massive dunk in the opening quarter. Afterwards, Adams was asked how much he and his pal were trash-talking during the game. "Enough," he said. "There's a bit of bants, mate, a bit of banter - it's always fun. "It's the only time I get to see him, to be honest, so it builds up." Adams insisted his comments to Fizdale were intended to disrupt the Knicks and get one of their best players back on the bench. "I was trying to discourage him, mate. He's a bloody good player and it's best for us to have him off the court. "If [Fizdale] listened to me, that's great, but he didn't." Adams finished the game with 19 points, six rebounds, five assists and a block on Kanter, who also scored 19 points. But at the end of the day, the friendship was back on, with Adams and Kanter posing for a social media pic together.